Tintin Heart: Ditzy-Craftmessers Challenge-Black and Pink! Ditzy-Craftymessers Challenge launched 25th February - Black and Pink! Here is my DT card for the Black and Pink Challenge. The card was inspired by the freebie backing papers from issues 96 of Quick Cards Magazine and teamed with some black, pink and white cardstock. The freebie paper was printed onto parchment to get a translucent effect to allow some of the black from cardstock beneath to come through. 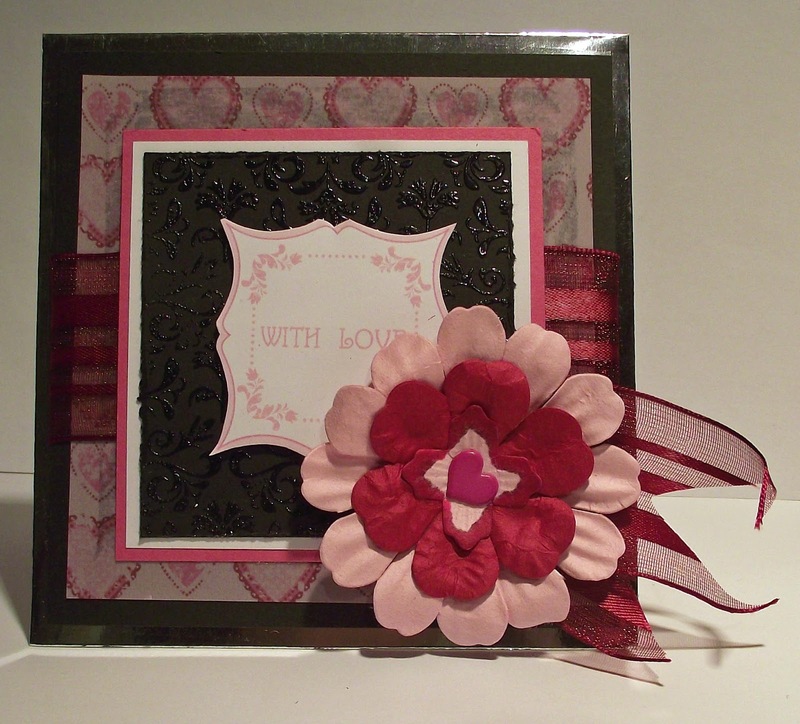 A belly band of dark pink organza ribbon was added and a 'With Love' sentiment from the same freebie pack was matted onto black, white and pink cardstock. The black card stock had beeen stamped with a damask pattern using Versamark and clear embossing powder to add texture. The completed topper was mounted onto a 5x5 mirri-card base in silver.The card was finished with some Rayher paper flowers fastened together with a pink heart brad and a 'tail' of the same organza ribbon. Thanks for taking time to stop by and read my blog. Your time and comments are appreciated. Beautiful card Angela. Love the flower and ribbon!